Pathogenesis of tendinopathies: inflammation or degeneration? The intrinsic pathogenetic mechanisms of tendinopathies are largely unknown and whether inflammation or degeneration has the prominent role is still a matter of debate. Assuming that there is a continuum from physiology to pathology, overuse may be considered as the initial disease factor; in this context, microruptures of tendon fibers occur and several molecules are expressed, some of which promote the healing process, while others, including inflammatory cytokines, act as disease mediators. Neural in-growth that accompanies the neovessels explains the occurrence of pain and triggers neurogenic-mediated inflammation. It is conceivable that inflammation and degeneration are not mutually exclusive, but work together in the pathogenesis of tendinopathies. Primary disorders of tendons are common and account for a high proportion of referrals to rheumatologists and orthopedic surgeons . The most commonly involved tendons are the rotator cuff (particularly supraspinatus) and biceps brachii tendons in the shoulder, the forearm extensor and flexor tendons in the forearm, the patella tendon in the knee, the Achilles tendon in the lower leg, and the tibialis posterior tendon in the ankle and foot. Historically, the term tendinitis was used to describe chronic pain referring to a symptomatic tendon, thus implying inflammation as a central pathological process. However, traditional treatment modalities aimed at modulating inflammation have limited success  and histological studies of surgical specimens consistently show the presence of degenerative lesions, with either absent or minimal inflammation [3, 4]. As will be clear in this review, we favor the hypothesis that inflammation and degenerative changes often coexist in the course of tendon disorders, and their relative contributions are difficult to dissect. Therefore, the definition of 'tendinitis' has been largely abandoned and the terms 'tendinosis' or, more generically, 'tendinopathy' (TP) are now currently preferred . In this review we summarize recent findings useful for understanding the pathogenesis of primary tendon diseases. First, suggestions coming from epidemiology, histopathology and clinics are reported, then we discuss new data on biochemical changes that occur in experimental and human TPs. Finally, we propose a unifying theory, drawn from both experimental and clinical data. The tendons are made up of bundles of collagen fibrils (primary, secondary and tertiary fibers), each wrapped in endotenon, which in turn is enveloped by an epitenon, forming the actual tendon. A true synovial sheath is present only in some tendons, such as tibialis posterior, peroneal, and extensor and flexor tendons of the wrist and the hand; other tendons do not have a true sheath, with the epitenon instead surrounded by a paratenon, a layer of thin tissue. The space between these two layers contains fluids rich in mucopolysaccharides that provide lubrication, prevent friction and protect the tendon . The extracellular matrix of tendons is made up of: collagen (65 to 80% dry weight), which is mostly composed of type I collagen and provides the tendons with strength to withstand high loads; elastin (1 to 2%), which insures flexibility and elastic properties; and ground substance, which consists of approximately 60 to 80% water, proteoglycans and glycoproteins. The cellular component is represented by tenoblasts and tenocytes, which are arranged in parallel rows between the collagen fibers. Tenoblasts are immature spindle-shaped tendon cells, containing abundant cytoplasmic organelles, reflecting their high metabolic activity. As they age, tenoblasts become elongated and transform into tenocytes. Together, tenoblasts and tenocytes account for 90 to 95% of the cellular elements of tendons. The remaining cellular elements consist of chondrocytes, synovial cells and endothelial cells. The musculotendinous junction is the junction area between the muscle and tendon. It is a complex area rich in nerve receptors and subjected to great mechanical stress during the transmission of muscular contractile force to the tendon. The osteotendinous junction (insertion of a tendon into bone), often referred to as an 'enthesis', involves a gradual transition from tendon to cartilage and to lamellar bone. Tendons are metabolically active tissues requiring vascular supply but, in some (Achilles tendon, tibialis posterior and supraspinatus), hypovascular or watershed areas have been identified. . For example, in the Achilles and supraspinatus tendons, the midportion has been shown to have less blood supply compared with the proximal and distal insertion regions . In these hypovascular areas, endostatin, an endogenous angiogenic inhibiting factor, is overexpressed. Studies in which cultures of rat tendon cells are exposed to intermittent hydrostatic pressure and the endostatin content in the medium measured show that mechanical factors are involved in the regulation of this anti-angiogenic factor . Innervation of tendons is provided by nerves from the surrounding muscles and by small fasciculi from cutaneous nerves [6, 9]. According to anatomical and functional differences, the nerve endings can be classified into four categories: type I, Ruffini corpuscles; type II, Vater-Pacini corpuscles; type III, Golgi tendon organs; and type IV, free nerve endings. The mechanoreceptors (types I to III), found inside and on the surface of the tendon, convert pressure or tension stimuli into afferent nervous signals. Ruffini corpuscles function as pressure sensors and have a relatively low threshold in reaction to pressure. They are slow adapting and respond to static conditions of position and stretch. Vater-Pacini corpuscles are also pressure sensors, but they adapt quickly and, therefore, can react to dynamic changes such as velocity and acceleration/deceleration. Golgi tendon organs, along the muscle spindles, are tension receptors and signal position. They react slowly to both active contraction and passive stretch of the involved muscle-tendon units and inhibit muscle contraction. Finally, free nerve endings, represented inside the tendons, but mainly in peritendinous tissue, are pain receptors. The number and location of nerve fibers and nerve endings varies according to the function of the tendon, being more represented in the smaller tendons involved in fine movements. The metabolic rate of tendons is relatively limited and is lower than that of skeletal muscle; oxygen consumption is 7.5 times lower and the turnover time for tendon collagen varies from 50 to 100 days . So, recovery of tendons after injury takes more time compared to muscles . It must be emphasized that tendons are 'engineered' according to the functional demands on them in specific anatomic locations . Therefore, tendons from different sites have differences in their structure, composition, cell phenotypes, and metabolism . There is evidence of different rates of collagen turnover, which is higher in stressed tendons such as the supraspinatus in the rotator cuff, and much lower in tendons that are not under high stress, such as the distal biceps tendon in the forearm. It is believed that TPs result from excessive loading and tensile strain. The mechanical behavior of the tendon depends on its cross-sectional area and length. The greater the cross-sectional area of a tendon, the larger its capacity to withstand heavy loads before failure ; with longer tendon fibers, the stiffness decreases and the force to failure remains the same, but elongation to failure increases . If one neglects viscoelastic properties, a typical stress-strain curve can be drawn . At rest, the collagen fibers and fibrils of the tendon are in a wavy or crimped configuration. Crimp provides a buffer in which slight longitudinal elongation can occur without fibrous damage, and acts as a shock absorber along the length of the tissue [15, 16]. As the collagen fibers deform, they respond linearly to increasing tendon loads. At up to approximately 4% elongation the fibers regain their original configuration after the tension is released. If the tendon is stressed beyond 4% of its length, the collagen fibers start to slide past one another as the intermolecular cross-links fail, and, at approximately 8% of elongation, a macroscopic rupture occurs because of tensile failure of the fibers and interfibrillar shear failure. Tendon elastin, however, can elongate by up to 70% of its original length without rupture, and breaks at 150%. An example is offered by the Achilles tendon. As the Achilles tendon descends, it spirals up to 90° laterally, so that fibers that were originally posterior become lateral (medial part of the gastrocnemius muscle), lateral fibers become anterior (lateral part of the gastrocnemius muscle) and anterior fibers become medial (soleus muscle at the distal end). The significance of this torsion is that a region of concentrated pressure force may be produced where the tendon bundles meet (tendon waist). This region is localized 2 to 5 cm above the calcaneal insertion, and has the poorest blood supply, as confirmed by the presence of areas of fibrocartilaginous tissue. Such avascularity can be argued to either directly cause a decrease in tensile strength or indirectly weaken the tendon through degenerative changes. An additional example is offered by the patellar tendon: forces acting through this tendon are considerable and it has been calculated that a force of 17 times bodyweight will act on a patella tendon during competitive weightlifting . The excessive loading, associated with adverse biomechanics (large quadriceps, external tibial torsion, femoral anteversion or excessive pronation of the feet) and a possible impingement of the inferior pole of the patella against the tendon during flexion, may explain this TP. Several factors have been implicated in TP pathogenesis, most of which may cause localized inflammatory reactions and also microdegeneration depending on the strength and duration of their presence. Genetic background may also play a role: sequence variation within the type V collagen (COL5A1) and Tenascin C (TNC) genes  have been shown to be associated with chronic TP . A genetic component may give rise to abnormal collagen formation ('mesenchymal syndrome'): patients affected by this syndrome are prone to have multiple problems that may include rotator cuff pathology, epicondilopathy, carpal tunnel syndrome, triggering of the long finger flexor tendons, and wrist extensor tendon pathology such as De Quervain's disease . Epidemiology is also of great help in understanding pathogenesis . The prevalence of rotator cuff TP increases with age: studies on cadavers show prevalence ranging from 30 to 50% in individuals aged 70 years and over, although it is very frequently clinically silent [22, 23]. Several etiological factors have been associated with the development of rotator cuff disorders : traumatic events, such as anterior glenohumeral dislocation and fracture of the greater tuberosity, or other insults that may occur in young athletes, such as swimmers or tennis players; traction, compression and overload in general, to which the cuff is exposed throughout life; and age-related degeneration, with amyloid and calcium crystal deposition. Sports commonly associated with TP of wrist extensors include racket sports (tennis elbow) and, more generally, sports that involve a throwing action resulting in eccentric loading of the forearm muscles. In golfer's elbow the pronator teres and flexor carpi radialis tendons are more frequently involved. Triceps TP is observed almost exclusively in males undertaking regular heavy manual work and in throwing athletes. It results from repetitive resistance of elbow extension, resulting in a traction injury through the tendon's insertion into the olecranon . Insertional patellar TP (at the proximal end of the patellar tendon) and injuries of the patellar tendon are common in athletes involved in some type of repetitive activity, such as jumping (volleyball, basketball, and so on), kicking (football), quick stops and starts (tennis, squash), and running (sprinters, endurance running) [26, 27]. Tibialis posterior TP occurs frequently in runners and is associated with valgus flatfoot-pronation deformities. Ligamentous laxity, articular hypermobility, a shallow retromalleolar groove and a tight flexor retinaculum may favor this TP . Poor vascularization in some areas of this tendon close to the medial malleolus may also account for it . Achilles TP is an injury that frequently occurs in athletes performing sport activities that include running or jumping, even though it has also been demonstrated in physically inactive individuals . The highest incidence is usually reported to occur in middle-aged people (30 to 55 years old) . Malalignment of the lower extremity, which favors Achilles TP, is proposed to increase forefoot pronation, limit mobility of the subtalar joint, decrease/increase the range of motion of the ankle, lead to varus deformity of the forefoot, and increase hind foot inversion and impingement . All these factors, independently or together, may affect the running or walking pattern and, in turn, affect the way the Achilles tendon is loaded. On the basis of epidemiological studies , several risk factors have been identified in two large categories: extrinsic and intrinsic . Among the extrinsic factors, as well as overuse linked to sports activities, training errors and fatigue must be considered. For example, in Achilles TP, excessive distance, intensity, or hill work, erroneous running technique, as well as changes in playing surface seem to be predominant in acute injuries. Environmental conditions, such as cold weather during outdoor training, and faulty footwear and equipment may also be risk factors. The use of several drugs has been associated with TPs: the association has been proven for fluroquinolone antibiotics , whereas the responsibility of statins , oral contraceptives and locally injected corticosteroids [36, 37] is debated. Among the intrinsic factors, several pathological conditions must be considered. Holmes and Lin  evaluated the association between TP and endocrinometabolic diseases (obesity, diabetes mellitus, hypertension, increased serum lipids, hyperuricemia) and found a positive association between Achilles TP and hormone replacement therapy, oral contraceptives and obesity. Hypertension was statistically associated with TP only for women, whereas diabetes mellitus had a statistical association for men younger than 44 years old. These findings suggest that factors influencing microvascularity may have importance in the development of TP. In diabetes, condensation of glucose with amino groups results in accumulation of advanced glycation end products (AGEs) in tendon tissue . Glycated tendons can withstand more load and tensile stress than non-glycated tendons, but the tissue becomes stiffer [40, 41]. It has been shown that high amounts of AGEs cause a fusion of collagen fibrils, which display larger diameters. Finally, AGEs up-regulate connective tissue growth factor in fibroblasts, which favors the formation of fibrosis over time in diabetic patients [42–44]. Other diseases that have been found to be associated with TP include systemic diseases, neurological conditions, infectious diseases, chronic renal failure, psoriasis, systemic lupus erythematosus, hyperparathyroidism and hyperthyroidism . Finally, aging in itself has a negative effect on mechanical properties of tendons, which could be due to reduced arterial blood flow, local hypoxia, free radical production, impaired metabolism and nutrition and AGEs [46–48]. The clinical scenario is quite uniform for all TPs. Patients complain of pain at the site of the tendon affected, which sometimes arises insidiously during a heavy training session or from one specific athletic movement and may ease completely while exercising; with time and continued activity, however, the pain worsens and limits sporting performance. Eventually, pain can develop during light activities and can even be present at rest. A common complaint is a feeling of stiffness in the morning or after rest. Physical examination may reveal local tenderness, swelling and reduced articular range of motion, which are signs of inflammation [49, 50]. It is worth noting that there is no evident relationship between the extent of the anatomical damage, as shown by ultrasound or magnetic resonance imaging, and symptoms: such variations in symptoms and, more specifically, why some patients have pain and others do not is a question that remains to be answered. Tendons are also subjected to sudden ruptures after a single bout of heavy activity; in some cases this happens in individuals with a known clinical picture of chronic TP, but otherwise may be unexpected. This means that TP may develop asymptomatically. Inflammatory and degenerative changes are not found in isolation in histopathological assessments of TP, and very often coexist in adjacent areas of pathological samples. In general, the macroscopic intratendinous changes in TP can be described as poorly demarcated intratendinous regions with a focal loss of tendon structure. The affected portions of the tendon lose their normal glistening white appearance and become grey and amorphous. The thickening can be diffuse, fusiform, or nodular. Histologically, degenerative changes (classified as hypoxic, hyaline, mucoid or myxoid, fibrinoid and fatty degenerations) are found in 90% of biopsy specimens taken from symptomatic parts of the tendon [51–53]. Calcifications or fibrocartilaginous and osseous metaplasia can also occasionally be found. The different parts of degenerated areas of a tendon display great variation in cellular density. In some areas, an increased number of cells with high metabolic activity can be seen, whereas in other areas cells are totally lacking or only few cells with pyknotic nuclei can be seen. Pathological changes are also frequently seen in the tendon matrix. Mucoid material with a simultaneous loss or separation of collagen fibers from each other is a common finding. The collagen fibers commonly show unequal and irregular crimping as well as loss of the transverse bands, separation and complete rupturing of the fibers, and increased crimping. The degenerated and degraded type I collagen fibers are sometimes replaced by calcification or by the accumulation of lipid cells (tendolipomatosis). Whereas normal tendons mainly comprise type I collagen, injured tendons have a higher percentage of type III collagen, which is deficient in the number of cross-links between and within the tropocollagen units . The clinical relevance of these intratendinous degenerative changes is largely unknown: hypoxic degenerative TP, mucoid degeneration, tendolipomatosis, and calcifying TP, either alone or in combination, can be seen in a high percentage of the urban population of healthy, asymptomatic individuals who are at least 35 years old [55, 56]. With degeneration, some tendons (Achilles, patella, elbow tendons, fascia plantaris) have shown proliferation of new vessels inside the tendon [57, 58]. Several authors [57–59], by means of color and power Doppler examinations, have observed 'in vivo' that neovascularization is frequent in patients symptomatic for pain. Peritendinous changes are frequently observed: these changes are more frequent in tendons with a synovial sheath, such as tibialis posterior, peroneal, and extensor and flexor tendons of the wrist and hand [49, 50]. On histological examination, in the acute phases of TP, fibrinous exudate is present, followed by widespread proliferation of fibroblasts. Again, degenerative changes seem to proceed in parallel with inflammatory and regenerative phenomena. Later, the peritendinous tissue appears thickened on macroscopic examination. Adhesions between the tendon and the paratenon are frequently seen. Two types of cells have been identified in the peritendinous tissue in the chronic phase of TP: fibroblasts and myofibroblasts . During biological processes that include extensive tissue remodeling, fibroblasts may acquire morphological and biochemical features of contractile cells, and have thus been named myofibroblasts. Myofibroblasts have smooth muscle actin in their cytoplasm and are thus capable of creating forces required for wound contraction. These cells can induce and maintain a prolonged contracted state in peritendinous adhesions, which, in turn, may lead to constriction of vascular channels, with further impairment of circulation inside the tendon, where a proliferation of new microvessels is frequently present. Healing studies of Achilles tendon after experimental section may be useful for understanding what happens in TPs. Indeed, the microruptures that occur because of excessive load seem to reproduce, at the microscopic level, the cascade of events following the macrorupture of a tendon. Limitations are related to species, the skeletal characteristics of animals and their peculiar loading modalities . The most detailed studies have been made in experimental acute tendon damage. Moreover, important differences between experimental acute injury and spontaneous rupture in humans must be acknowledged. First, in experimental situations, the tendon tissue is normal, whereas it shows chronic degeneration in humans; and second, in animals the synovial sheath disruption at the time of injury allows granulation tissue and tenocytes from surrounding tissue to invade the repair site, whereas in chronic TPs the ruptures happen inside the tendon. In spite of these drawbacks, significant insights have been obtained. Tendon healing occurs in three distinct but partially overlapping phases [62, 63]. The acute inflammatory phase lasts for up to 3 to 7 days after injury. The process starts with a hematoma and platelet activation. Erythrocytes and inflammatory cells, particularly neutrophils, enter the site of injury. In the first 24 hours, monocytes and macrophages predominate, and phagocytosis of necrotic material occurs. Vasoactive and chemotactic factors are released. The proliferation phase lasts between 5 and 21 days. Fibroblasts produce collagen, which gradually increases the mechanical strength of the tendon, so that loading can lead to elastic deformation, which allows mechanical signalling to start to influence the process. Three main phases can be distinguished in collagen fibrillogenesis . First, collagen molecules assemble extra-cellularly in close association with the fibroblasts to form immature fibrils (collagen fibrillogenesis) . Then, the fibrils assemble end to end to form longer fibrils (linear growth). In a third step, fibrils associate laterally to generate large diameter fibrils (lateral growth) . Fibrils gather into fibers, whose coalescence finally forms very large fibers, which are characteristic of the tendon . The large transverse area compensates for tissue weakness, so that considerable traction forces can be sustained [68, 69]. The last phase is the maturation and remodeling phase and it can last for up to a year. The cross-linking among collagen fibers increases and the tensile strength, elasticity and structure of the tendon are improved. Molecular biology studies have made it possible to identify the factors that promote the healing process , which is primarily mediated by matrix metalloproteinases (MMPs) and metalloproteinases with thrombospondin motifs (ADAMTs)  and their tissue inhibitors (TIMPs) . The expression of MMP-9 and MMP-13 increases between days 7 and 14 after surgery, whereas the levels of MMP-2, MMP-3 and MMP-14 remain high until day 28. These findings suggest that MMP-9 and MMP-13 participate in collagen degradation only, whereas MMP-2, MMP-3 and MMP-14 participate in both collagen degradation and collagen remodeling . Wounding and inflammation also provoke the release of growth factors and cytokines from platelets, polymorphonuclear leukocytes, macrophages and other inflammatory cells. These growth factors induce neovascularization and stimulate fibroblasts and tenocyte proliferation and synthesis of collagen . The most well documented of these factors are growth and differentiation factors (GDFs) and Scleraxis (Scx). GDFs are a subgroup of the tumor growth factor-β and bone morphogenetic protein superfamily . These factors are secreted as mature peptides: some of them (GDF5, GDF6 and GDF7) play a role in osteogenesis, but there is evidence that they may also be involved in tendon morphogenesis . Studies in GDF5-deficient mice have shown some anomalies in tendon formation, mainly due to altered collagen structure and excessive death through apoptosis of mesenchymal cells . In addition, in studies in adult animal models of tendon neoformation, GDFs showed the ability to induce ectopic formation of connective tissue rich in collagen I in a fashion that resembles neoformation of tendon and ligaments . In Molloy and colleagues' study , performed on a model of supraspinatus TP in the rat, genes encoding tumor growth factor-β, fibroblast growth factors (FGFs) and their receptors were also significantly up-regulated. These molecules likely coordinate growth and proliferation of both endogenous fibroblasts and inflammatory cells in the affected area . Numerous studies have implicated the FGFs as key molecules during the various steps of tendon healing. Basic FGF has been detected in normal tendon fibroblasts and its expression increases at injured sites in various animal models . Scx is the best characterized marker of tendon morphogenesis , and there is some evidence that Scx activation can induce tendon neoformation. Léjard and colleagues  reported that Scx regulates the expression of the gene COL1A1 in tendon fibroblasts. Severely disrupted tendon differentiation and formation have been observed in mutant mice homozygous for a null Scx allele (Sck-/- mice) . Mesenchymal stem cells (MSCs) have been identified as candidates for tendon neoformation : mouse dental follicle cells, when implanted in vivo, generate periodontal ligament-ike tissue ; and MSCs implanted under the skin of mice together with different carriers (Gelfoam, Matrigel or hydroxyl-apatite/tricalcium phosphate) form tendon-like tissues with tendon-specific parallel alignments of collagen fibers . Tendon tissue-engineered constructs seeded with human umbilical vein MSCs were significantly stronger and stiffer compared with constructs composed of cellular collagen gel alone . Nitric oxide (NO) is also involved in the healing process. This substance is synthesized by a family of enzymes, the nitric oxide synthases (NOSs). Different isoforms of NOS have been identified: eNOS (found in endothelial cells) and bNOS (found in brain and neuronal tissue) are constitutive and important in blood pressure regulation and memory; iNOS is an isoform that can be induced by pro-inflammatory cytokines and is important in host defense [87, 88]. Murrell , in experimental rat models developed to evaluate Achilles tendon and rotator cuff healing, found remarkably increased expression of all three NOS isoforms after surgical excision (iNOS at days 4 and 7, eNOS at day 7 and bNOS at day 21). It is likely that NO favors the healing process by increasing collagen synthesis, as shown by in vitro experiments in which cultured tendon cells were exposed to exogenous NO and to the NO inhibitor flurbiprofen. When flurbiprofen was administered, the healing of injured tendons was significantly reduced, as shown by the reduction in their cross-sectional area and mechanical properties [90, 91]. The mechanisms of tendon healing have also been investigated using other experimental procedures . In rabbits, tendon damage has been induced by an excessive mechanical load. When the damage is induced acutely (6 hours after a single exercise session), an inflammatory cell infiltrate is seen within the Achilles tendon. However, when a more chronic loading program is used (over 11 weeks), only degenerative histological changes are seen [93, 94]. The timing of observation differs, so an early phase of low level inflammation cannot be ruled out. In a similar fashion, studies performed on the overloaded equine superficial digital flexor tendon [95, 96] show an early inflammatory reaction that is followed by degenerative alterations. These experimental findings suggest that acute inflammation may be involved from the start  and that a degenerative process soon supercedes it, but the relationship between the two phenomena is unclear. Experimental studies in the rat, performed with the aim of investigating the mechanisms of pain , demonstrated the up-regulation of genes encoding the glutamate signaling machinery (metabotropic glutamate receptors 5 to 6). Forsgren and colleagues  and Andersson and colleagues  have also observed the over-expression of the genes encoding N-methyl-D-aspartic acid receptor-like 1 as well as Substance P (SP), Neurokinin-1 receptor, Calcitonin gene related peptide (CGRP) and α-1 adrenoreceptors. Furthermore, it has been demonstrated that, when glutamate extra-cellular concentration reaches a certain threshold, rapid tendon cell swelling occurs, followed by lysis and apoptosis . Studies on animals show evidence of oxidative damage and increased amounts of apoptosis when tendons are submitted to high dose cyclic strain. Two pathways could be associated with oxidative stress: activation of c-Jun amino-terminal kinase and increase of cytochrome c-related activation of caspase-3 . Finally, studies in rabbits show that mast cells close to neural elements release neuropeptides (SP and CGRP) and mast cell mediators (histamine, prostaglandins and leukotrienes), influencing both fibroblast activity and vascular permeability. Estrogen and progesterone receptors are present in tendon tissue and modulate transcript levels for Cyclooxygenase-2, MMP-1, MMP-3, iNOS and tumor necrosis factor [100, 101]. Although more relevant, the study of etiopathogenesis of TP in humans is hampered by several limitations. One of the major limitations is represented by the fact that human tendons are usually studied only when they become symptomatic and information is obtained from patients with advanced disease who undergo surgery while less symptomatic subjects are treated conservatively; the early phase of disease is thus not available for study. Using microdialysis techniques, it has been possible to obtain, by means of continuous perfusion, samples of fluids from inside the Achilles tendon, and to evaluate different substances of biological interest in these samples. In subjects with chronic TPs, Alfredson and colleagues  reported that prostaglandin E2 (PGE2) concentrations were similar to those found in normal tendons, thus excluding the participation of so-called chemical inflammation in the later phases of disease. However, this conclusion is challenged by Yang and colleagues , who observed that repetitive mechanical stretching increases PGE2 production in human patellar tendon fibroblasts. PGE2 is a potent inhibitor of type I collagen synthesis [103–105] and it has recently been shown that PGE2 has catabolic effects on tendon structure, decreasing proliferation and collagen production in human patellar tendon fibroblasts . Moreover, lactate levels were significantly higher in pathological Achilles tendons compared with normal tendons. This finding indicates that there are anaerobic conditions in the tendon, possibly due to insufficient vascular supply [107, 108]. Extending these experiments, Pufe and colleagues [109, 110] have shown in degenerate Achilles human tendon tissue that hypoxia induces the production of the transcription factor hypoxia inducible factor, which, in turn, leads to subsequent expression of vascular endothelial growth factor (VEGF). Four important VEGF isoforms with 121, 165, 189, and 205 amino acids, respectively, can be generated as a result of alternative splicing from the VEGF gene. Splice variants VEGF121 and VEGF165 have the highest angiogenic potency [111, 112]. VEGF promotes angiogenesis in vivo and renders the microvasculature hyperpermeable to circulating macromolecules . Besides its angiogenic properties, VEGF might influence the course of degenerative tendon disease in another way. VEGF is able to up-regulate the expression of MMPs, which increase the degradation of the extracellular matrix, and to down-regulate TIMP-3, so altering the material properties of tendons [6, 114, 115]. This might predispose the tendon to recurrent microdamage and, in the long term, spontaneous rupture. Inflammatory cytokines such as endothelial growth factor or platelet derived growth factor, which are expressed during the healing process, and hypoxia have a synergistic effect on VEGF expression in tendon tissue [109, 110]. These observations in human TPs further support the entangled roles of inflammation and subsequent degeneration within tendons, which are substantiated by biochemical changes revealed by microdialysis studies. When neo-angiogenesis occurs, nerves usually 'travel with' neovessels inside the tendon . This has been proven by both histopathology (tendon biopsies performed in areas with TP) and immunohistochemical studies . These data favor the hypothesis that neovascularization is associated with the clinical symptomatology and, in particular, with pain. Other microdialysis studies, performed by Alfredson and colleagues [3, 4], have shown that intratendinous glutamate levels are significantly higher in painful tendons than in normal pain-free tendons. The chain of events leading to pain furthermore may increase neo-angiogenesis and nerve proliferation in a vicious circle. In fact, SP and CGRP can induce vasodilation and neurogenic inflammation [116, 117], although this is obviously a different inflammatory entity and not due to the biochemical mediators of 'leukocyte'-driven inflammation. In order to give an organic explanation to all the data collected, as suggested by Fredberg and colleagues , a comprehensive pathogenetic theory may be proposed. It is well known that well-structured, long-term exercise, well within a physiological range, does not harm the tendon but actually reinforces it, stimulating the production of new collagen fibers. Studies on collagen turnover performed in humans by means of microdialysis techniques show that, after different types of exercise, both synthesis and degradation of collagen are increased, but collagen synthesis prevails and persists longer than collagen degradation [119–121]. The tendon tissue becomes larger, stronger and more resistant to injury, with increases in tensile strength and elastic stiffness . During exercise, both isometric and dynamic, blood flow increases in the tendon and peritendinous area. The biochemical adaptation to exercise is characterized by the release of inflammatory and growth substances, both in the general circulation and locally in tendons: among them is interleukin-1β, which in turn results in the increased expression of Cyclooxygenase-2, MMPs and ADAMTS . These enzymes are important in regulating cell activity as well as matrix degradation, and they have roles in fiber growth and development. However, epidemiological observations clearly show that the initial culprit of TP is represented by the overuse of the tendon . Indeed, TPs are conditions that affect mainly athletes and active people who are involved in activities that stress a specific tendon. When the tendon is overloaded and submitted to repetitive strain, the collagen fibers begin to slide past one another, breaking their cross-links and causing tissue denaturation. This cumulative microtrauma is thought not only to weaken collagen cross-linking but also to affect the non-collagenous matrix as well as the vascular elements of the tendon [124–126]. Moreover, when the tendon is submitted to strenuous exercise, very high temperatures develop inside. Failure to control exercise-induced hyperthermia can result in tendon cell death. Peaks of 43 to 45°C can be reached inside the tendon and experimental studies show that temperatures above 42.5°C result in fibroblast death. This might predispose the tissue for degeneration mainly when, in hypovascular areas, its capability to regulate its inner temperature is hampered. Therefore, there is the possibility that exercise-induced localized hyperthermia may be detrimental to tendon cell survival rather than vascular compromise itself . In these conditions, the mechanisms of healing and damage are simultaneously activated. The healing mechanisms include the over-expression of some MMPs, ADAMTs, NOS, GDFs and Scx [63, 77]; the damage mechanisms are represented by increased MMP-3 expression, which favors the degradation of extracellular matrix, and by the overproduction of inflammatory cytokines, such as endothelial growth factor, platelet derived growth factor, leukotrienes, and PGE2 [6, 128]. Given the low metabolic rate of tendons, the optimal conditions for good healing are: adequate recovery time; absence of further overloading; and suitable metabolism and blood supply. When these conditions are not satisfied, the healing mechanisms fail. 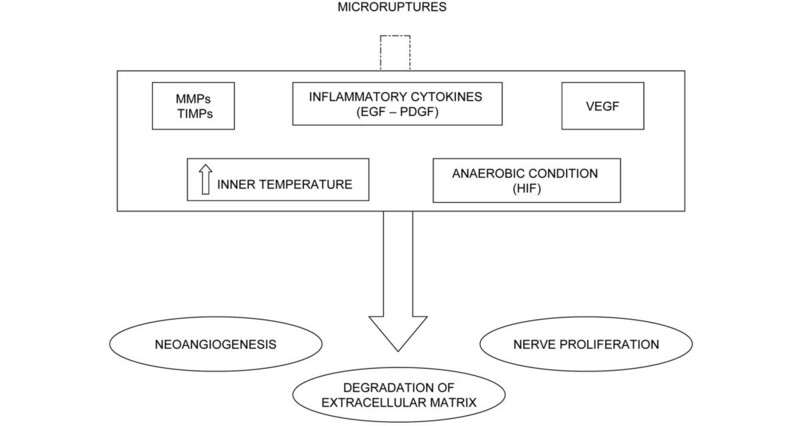 Unfavorable situations may be represented by predisposing factors (genetic and reduced physiological blood supply in specific areas), or by several risk factors, both extrinsic (heavy sport activities, environmental conditions, training errors in athletes) and intrinsic (age, osteoarticular pathologies, and systemic diseases affecting microcirculation or collagen metabolism). This explains why subjects respond differently to overloading, such that the threshold for repair may vary largely from one subject to another. Hypoxia induces the production of hypoxia inducible factor, which, in turn, leads to subsequent VEGF expression [109, 110], which promotes angiogenesis, is able to up-regulate the expression of MMPs, and down-regulates TIMP-3, so altering the material properties of tendon. The invasion of vessels into a region hypovascularized under physiological conditions and MMP expression leads to a weakening of the normal tendon structure. In this phase the subject, albeit showing signs of degeneration and neovascularization at ultrasound evaluation, is usually asymptomatic, even if pain may arise as the result of peritendinitis, which is exquisitely inflammatory in nature (Figure 1). When the overload overcomes the thresholds of repair or the tendon is submitted to further loads without adequate recovery time, the healing process fails and the pathogenetic cascade leading to tendinopathy occurs. Mechanisms of damage. EGF, epidermal growth factor; HIF, hypoxia inducible factor; MMP, matrix metalloproteinase; PDGF, platelet-derived growth factor; TIMP, tissue inhibitor of metalloproteinase; VEGF, vascular endothelial growth factor. The transition to the symptomatic phase is usually marked by characteristic histological changes: the invasion of vessels is followed by nerve proliferation, and glutamate levels increase and are responsible for pain during the course of the disease (Figure 2). Neo-angiogenesis and nerve proliferation lead to pain when the production of algogenic substances reaches a critical threshold. These substance may further damage the tendon. 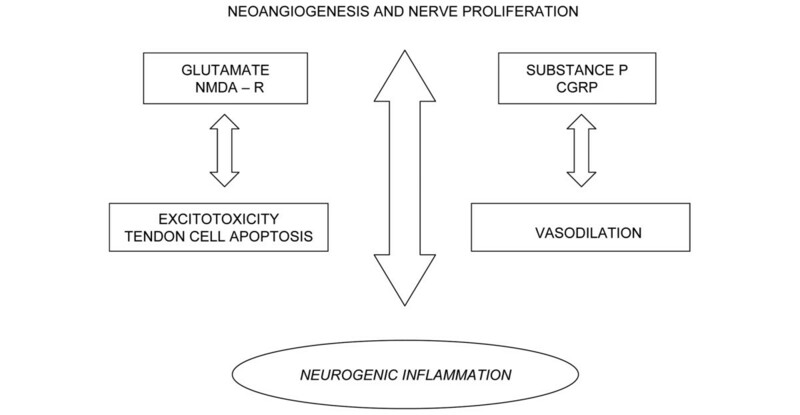 From neovascularization to neurogenic inflammation. CGRP, Calcitonin gene related peptide; NMDA-R, N-methyl-D-aspartic acid receptor. In summary, the pathogenesis of TP is a continuum from physiology to overt clinical presentation. This sequence of events can be compared with an iceberg, having several thresholds, pain being the tip of the iceberg (Figure 3). The base of the 'iceberg' represents what happens under physiological conditions. When damage develops, two phases may be recognized: the asymptomatic and symptomatic phases. This definition implies that pain is the alarm symptom: indeed, it is uncommon, with the exception of professional top-level athletes, that tendon abnormalities can be detected earlier by systematic ultrasound evaluation . It should be noted, however, that the timing of these events may vary considerably due to several individual factors. Under physiological conditions, exercise increases the strength of the tendon, but when the individual threshold is overcome, microdamage may occur. If the tendon is given adequate time to recover, in good local conditions of blood flow and nutrition, the healing machinery will prevail with complete repair. However, if the recovery time is too short and blood flow is inadequate, the repetitive strain will lead to microdamage inside the tendon (the first phase of TP): a very thin line, indeed, divides healthy and non-healthy physical exercise. Therefore, TP appears to result from an imbalance between protective and regenerative changes and the pathological responses to tendon overuse. In the second phase, a pathogenetic cascade involving the production of pro-inflammatory cytokines, vascular growth factors, and oxygen free radicals will take place, resulting in degradation of the tendon, neovascularization and possibly nerve proliferation. However, in this phase the subject is still asymptomatic until a new threshold in neovascularization and neural in-growth is reached and pain occurs. 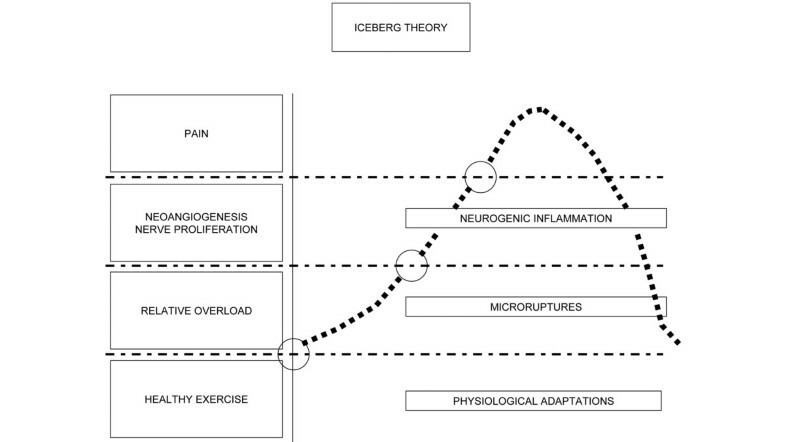 The 'iceberg theory' can thus explain the frequent relapse of symptoms when athletes resume sport activities after too short a rehabilitation period, during which pain recedes to just below the detection threshold while most of the intratendinous abnormalities still exist. Moreover, this theory explains how a complete rupture with evident degeneration may occur in a tendon but still be painless . Coming back to the title of this review, inflammation and degeneration are not mutually exclusive, but work together in the pathogenetic cascade of TP [130–133]. This can explain why the response to therapy may be different from one case to another . Non-steroidal anti-inflammatory drugs  and steroids [136, 137] may be beneficial for pain and function in the early phases of disease, but are usually ineffective later [135, 138]. In the advanced phases, sclerosing therapy, destroying new vessels and nerves, reduces pain and restores function [139–143]. Eccentric training, which stops blood flow when the ankle joint is in dorsal flexion, may act with a mechanism similar to sclerosing therapy, that is, through reducing neo-angiogenesis [139, 144, 145]. Maffulli and colleagues, however, claim that tendons respond to mechanical forces by adapting both their metabolism and by altering gene expression, so that eccentric training could work both metabolically and mechanically [49, 144]. Indeed, the succession of events is very complex, involving the release of many substances that may heal the injured tendon but also act as disease mediators. Therefore, new therapeutic approaches may be envisaged. Preliminary studies utilizing adalimumab (a tumor necrosis factor-alpha blocker), anakinra (an interleukin-1 antagonist)  or apronitin (a MMP-inhibitor)  or tropisetron (a 5-HT3 receptor antagonist with anti-inflammatory properties) have produced encouraging results . Local NO delivery, by means of glycerol trinitrate patches, has been proven to be beneficial by some authors, with reduction of pain and increases in strength in subjects with tennis elbow, Achilles TP and supraspinatus tendinosis , but other studies have failed to support its efficacy in Achilles TP [149, 150]. A variety of materials have also been used in the formation of scaffolds, including natural components, such as collagen , as well as copolymers . Several preliminary studies suggest adding exogenous growth factors to injured tendons in order to enhance healing and repair, but it is unclear whether there is a role for these factors in the treatment of TP in humans [153, 154]. Platelet rich plasma has recently emerged as a potential biological tool to treat tendon disorders based on the release of growth factors that occurs with platelet rupture . For example, injection of FGF recombinant proteins in injured rat patellar tendons increases cell proliferation and type 3 collagen expression . Finally, there is now evidence of a population of regenerating stem cells within tendons . There is increasing interest in the biology of MSCs isolated from bone marrow aspirates, adipose tissue, umbilical cord and various other tissues for their potential clinical use . Tendons and ligaments regenerate and repair slowly and inefficiently in vivo after injury due to low proliferation rate and poor vascularization. There are many similarities between the weight-bearing tendons of the horse and human tendons, as well as in the nature of strain-induced injuries to them. The use of stem cells within veterinary medicine has been reviewed elsewhere [158, 159]. Tissue engineering approaches have been investigated to improve tendon rupture healing by transplantation of in vitro cultured tenocytes, obtained from tendons, seeded in matrices , but limited proliferative capacity and matrix production represent strong limitations. MSCs preferentially home to damaged tissues where they exert their therapeutic potential. A striking feature of the MSCs is their low inherent immunogenicity as they induce little reaction from host immune cells, perhaps due to intrinsic immunosuppressive activity . MSCs, with appropriate stimulation and/or gene transfer, represent an opportunity to produce in vitro tenocytes able to promote tendon healing [156, 162]. Applying stem cell technology to the treatment of degenerative conditions of the musculoskeletal system such as TP is very appealing and early work suggests that this technology may have a role in tendon repair [163, 164]. Genetically engineered autologous cells as gene carriers  have been shown to lead to quicker recovery and improved biomechanical properties of Achilles tendons. In addition, molecules that selectively activate Scx or its target genes also might be beneficial [75, 156, 163]. Recent reports of the potential involvement of matrix remodeling and Wnt signaling during tenogenesis of human MSCs in a dynamic mechanoactive environmental model provide insights into the mechanisms of tenogenesis and support the potential of adult stem cells in tendon injuries [165, 166]. The use of stem cells to repair damage, either through direct application or in conjunction with scaffolding, has been reviewed recently with regard to applicability to human tendon, scaffolding for in vitro tendon generation, and chemical/molecular approaches to both induce efficient stem cell differentiation into tenocytes and maintain their proliferation in vitro [167, 168]. Various studies in animal models have shown the feasibility of gene transfer into tendons, using the reporter gene LacZ with retroviral, adenoviral, and liposomal vector delivery methods . TPs are very common disorders in professional athletes and in people practicing leisure sport activities. Epidemiological and clinical observations emphasize the role of repetitive mechanical overloading, but the intrinsic mechanisms of the disease are largely unknown: in particular, it is debated whether inflammation or degeneration has the prominent pathogenetic role. Recently, a large amount of experimental data has been generated, and on this basis we propose a comprehensive pathogenetic theory. Overuse is the initial disease factor, with microdisruption of tendon fibers. A complex process then takes place, mainly in areas with poor blood supply. GDFs are produced, and the expression of Scx, a protein that activates the gene encoding collagen type I-α1 in tendon fibroblasts, is enhanced and the healing of the tendon is supported by specific cellular lineages. At the same time, however, noxious mechanisms are activated, with increased expression of inflammatory mediators and VEGF. This factor stimulates the synthesis of MMPs, enzymes that increase the degradation of the extracellular matrix, and promotes neo-angiogenesis in vivo. The result is degeneration and weakening of the normal tendon structure. Neural in-growth accompanying the neo-vessels, on the other hand, leads to overexpression of glutamate, SP and CGRP: this explains the occurrence of pain and, possibly, triggers neurogenic-mediated inflammation. In conclusion, it is conceivable that inflammation and degeneration are not mutually exclusive, but work together in the pathogenetic cascade of TPs.